In an effort to avoid the impeding tariffs on goods from China, set to increase on January 1st but were pushed back to March 1st to give more time to the negotiations between these two nations, cargo has been streaming into ports and transferring to warehouses in a process called “front loading.” While this led to a robust December, early numbers for January are lower than expected. As Chinese Lunar New Year approaches this week, cargo volumes are expected to remain stalled until March, which is, coincidentally the start of 25% tariffs from China if new arrangements are not made. Combined with other trade factors, China is only expected to grow their exports around 4% in 2019, depending on the global trade demand. Part of that trade demand comes directly from how other nations reacted to the tariffs but exactly how they impacted the global trade cycle won’t be fully understood until February 14th when the numbers for Chinese exports are available. As the US economy continues to slow down, experts warn that the numbers we saw in 2018 won’t follow us into 2019, but few solid prognostications show a total recession in trade. Many figure once the intellectual property and trade imbalances are negotiated, the flow of exports back to the US will heat up again, likely just as rapidly as it did at the end of 2018. The issue for now is moving cargo with the impending Lunar New Year halting production in China for two solid weeks. 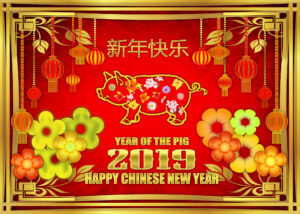 Lunar New Year begins today, February 5th and lasts until February 19th this year, the year of the Pig/Boar in Chinese culture. According to folklore, the pig is a sign of good fortune and a symbol of wealth, which could be an auspicious sign for the trade talks. If you’d like to learn more about the Chinese Lunar Calendar, you can follow this LINK.